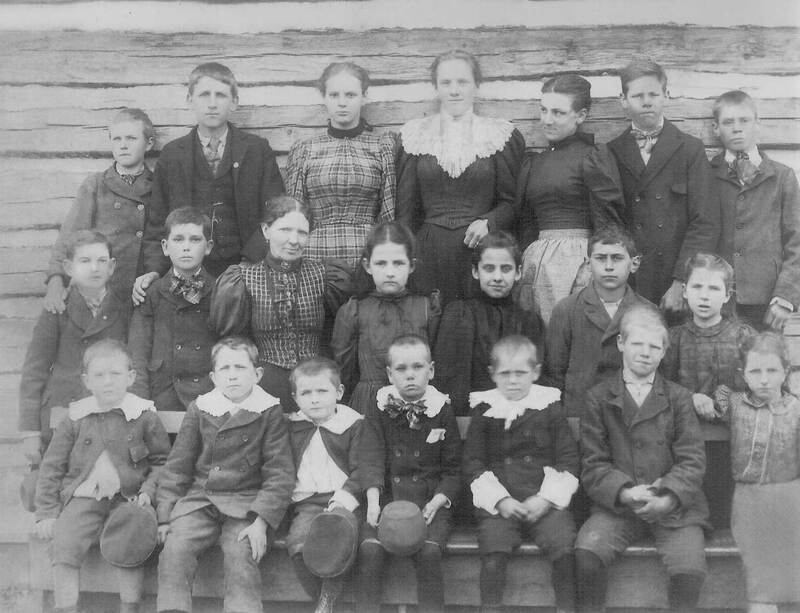 Buckingham County Teachers, 1894 | slate river ramblings . . . . Teacher Julia Augusta Tapscott Moseley is pictured in the third row. More teachers who appeared on the 1894 list have been identified. Thanks to Slate River Ramblings reader, Jeremy Winfrey! James Nathan Ayres (1849-1906), son of Mathias Leake Ayres and Martha Rebecca Hanes. He married Ann Virginia Brown and lived on the Slate River near present day Route 20. Hannah Laura Winfrey (1870-1935), daughter of CSA veteran George Hill Winfrey and Judith Catherine Robertson. She married George McKenna “Jake” Ayres and they lived on present day Route 721. Alice Walker Norvell (1872-1938), daughter of CSA veteran Thomas Benson Norvell and Mary Evalina Miller. She married Nelson Tindall Sr. and they operated the store at Centenary. Sidna Brown Steger (1874-1931), daughter of CSA veteran John Wesley Steger and Mary Elizabeth Brown. She married James T. Snoddy. They lived near the James River, near Fallsburg. Julia Augusta Tapscott Moseley (1852-1936), daughter of CSA veteran George Nicholas Tapscott and Ann E Scruggs. She married Mathias Leake Ayres Moseley and they lived at Tucker in the old Elbridge G. Jefferson home, Millbrook. The Tucker School and the Tucker Post Office were on this property. Susan Eldridge (1865-1942), daughter of John Rolfe Eldridge and Mary Eliza Hanes. Mary Gertrude Norvell (1874-1962), daughter of Thomas Benson Norvell and Mary Evalina Miller. The Norvells owned the land opposite the Tucker School. She married William Reginald Walker of Richmond. George Allan Tapscott CSA (1850-1935), son of CSA veteran, George Nicholas Tapscott, and Ann E.Scruggs. Married first to Mary E. Baber, second to Kate Norvell. He grew up in what would become Tucker, and lived just south of Route 652 on the west side of Sharps Creek Rd. After 1910, he and Kate moved to Hatton. Click here to see them listed: Buckingham County School Teachers I and Buckingham County School Teachers II.